7 March, 2017 – Camera manufacturer Basler has now moved its dart board level camera modules with BCON for LVDS interface into series production. The Basler dart camera series stands out for its strongly costoptimized design, resolutions of up to 5 megapixels and tremendous flexibility thanks to various mount options (S-mount, CS-mount and bare board). Just in time for the embedded world tradeshow in Nuremberg, 18 dart camera models with the BCON for LDVS interface and a matching development kit are being sent into series production. 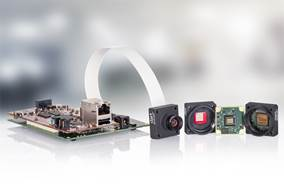 The BCON for LVDS interface technology was custom developed by Basler for use in embedded vision applications, and allows for camera modules to be connected to LVDS-based vision technologies. LVDS (Low Voltage Differential Signaling) is a standard interface for high-speed data transmission, although image transmission is not defined here in detail. BCON is used for reliable transfer of image data between camera model and cutting-edge FPGA-based embedded processing platforms (FPGA: Field Programmable Gate Array). When used in conjunction with a Basler dart board level camera module, the BCON for LVDS interface facilitates the setup and operation of lean image processing systems, which in turn establishes the necessary groundwork for cost savings in the design of embedded vision solutions. Beyond this, developers of embedded systems can switch flexibly and without extra integration costs between various dart camera models with the BCON for LVDS interface. To simplify integration of a Basler dart board level camera module with BCON for LVDS interface, Basler is also launching its PowerPack for Embedded Vision onto the market at the same time. This development kit is comprised of a Basler dart camera module with the BCON for LVDS interface and 5 megapixels of resolution, a lens, a processing board with Xilinx Zynq®-7010 SoC (System-on-Chip), cables and additional accessories. Beyond this, the development kit contains hardware and software reference implementations to demonstrate FPGA-based image capture by the Zynq SoC as well as connection of a dart BCON camera module to the Basler pylon camera software suite. As such, the development kit serves as a template for the design of complete embedded vision systems, which helps cut initial integration costs massively.